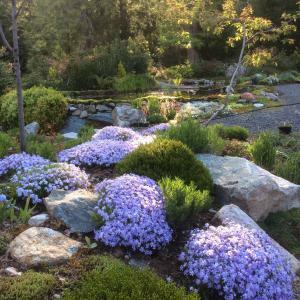 Shown here are creeping phlox, dwarf boxwood, hebe, thyme and iris, which would be considered safe to plant over the septic field. With the birds chirping, trees budding, throats and eyes itching…spring is in the air! With spring here, it is also a great time to start landscaping projects. A few things to keep in mind while landscaping around your septic system. If you do not have direct access to your tank – consider having Cat Cans install a riser and lid – BEFORE you spend money on landscaping. This quick and inexpensive task will prevent tearing up your beautiful landscaping when your tank needs pumped. Eco-grass naturalized lawns/meadows (some are sold specifically for septic field use). Shrubs – slow growing shrubs with fibrous, contained root systems. These are less likely to be a problem planted at the recommended distances from a drainfield. Trees with more vertical root growth. Also less likely to cause harm if planted at the recommended distance from a drainfield. There are countless lists of plants suggested for septic fields. This is not a comprehensive list, just a list of commonly used plants that will work with your septic field and not cause problems in the long run. Be sure to check your specific septic and site conditions and shade/sun preferences of the plants before selecting. We highly recommend working with a professional landscape company before planting shrubs, vines and trees – to ensure that they are planted within the recommended distance – there are no guarantee of root infiltration when it comes to trees, shrubs or vines.